A pure heart (Ps. 66:18-19) and a forgiving spirit (Mt. 6:14). Humility and repentance (Luke 18:10-14). The Bible is the infallable word of God revealed to man. It reveals the plan of God for mankind’s redemption, and expresses the will and the mind of God for His people. It is pure, perfect, and must not be altered (Ps. 19:7-8, Rev. 22:18-19). It is effectual, living and active (Is. 55:11, Heb. 4:12). It should be spoken faithfully and boldly (Jer. 23:28, Acts 4:29, 31), taught and obeyed (Acts 18:11, I Pet. 3:1, Luke 6:49), and handled accurately (2 Tim. 2:15). God desires fellowship with his people (Heb. 10: 22-25). Through Fellowship we build and maintain strong relationships (Acts. 20: 38) that are critically important to a strong, unified ministry, as well as personal development in the life of every believer. Faith is the substance of things hoped for, the evidence of things not seen (Heb. 11:1). With faith all things are possible (Mar 9:23, Mat 17:20). Is a part of a believer’s daily life (Rom 1:17). Is needed to receive the Word of God (Hebrews 4:2). 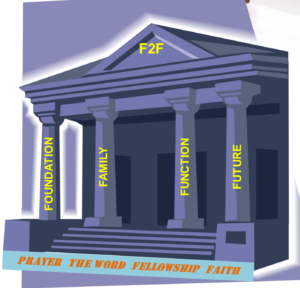 Objective – To internally and externally promote and enhance the foundational elements: embracing of the Word of God, effective prayer discipline, and wholesome fellowship. Activities – Revivals, Corporate Prayer, Koininia, Bible Study. Objective – To promote the natural and spiritual well-being of all Faith To Face families (including those involving singles, married couples, single parents, married parents, divorcees, and widow(er)s.
Activities – Fellowships, Benevolence & Outreach programs. Objective – To promote excellence in ministry in every area via training and establishment of best practices. Activities – Establishment of Bylaws, Ministry Team Training, Effective Communication, Leadership Conference. Objective – To prayerfully devise and implement plans and establish behaviors TODAY that will help ensure successful ministry TOMORROW. Activities – Establishment of 5 Year Vision.